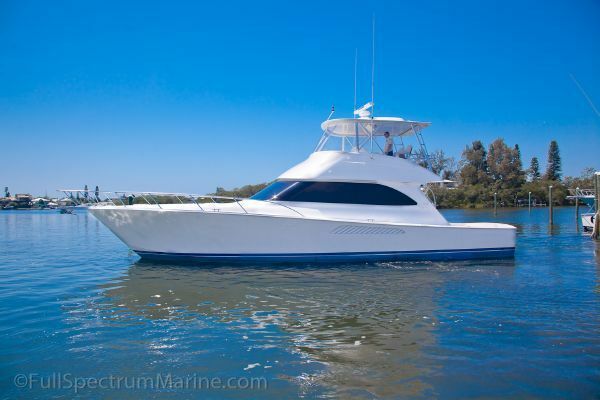 Galati Yacht sales is offering a special buying opportunity on stock #VK54-534. This is a hardtop equipped boat with integrated fiberglass steps to the bridge – which is ultra comfortable for the entire family. She is powered by the most desirable engine package – 1,550 hp MANs that will cruise effortlessly at 34 knots. List price is $2,531,775. MAKE US AN OFFER OF: $1,995,000 plus Full Retail for your trade (less commission). With breathtaking lines and stellar performance from powerful common-rail MAN diesels, the Viking 54 Convertible proudly carries the company banner to “build a better boat everyday” to even loftier heights. Viking has scored more home runs in the 42 to 82 foot class than any other manufacturer and the cutting edge 54 Convertible has grand slam written all over it. Like all Vikings, this boat started with a clean sheet of paper and a host of smart ideas garnered from sales and customer input, as well as from thousands of hours racked up by our Viking demo teams on the tournament trail. The 54 Convertible is beautifully proportioned, featuring a consortium of elements that give it both a modern appearance with a familiar eye-pleasing look that is germane to its stable mates. The stem has an aggressive rake to cut through head seas effortlessly. At almost 18 feet, the beam allows for a massive foredeck to create ample room to mount a dinghy or flats skiff on the bow, while providing amazing accommodations below in the three staterooms and two heads. The house rises smoothly from the deck like an ice sculpture and pertinent details abound, like the engine room vents, which casually mirror the salon windows. Overall, the 54’s profile is nothing less than stunning. Below the surface, it is all about form following function. Propeller pockets reduce the draft and create an efficient running angle by lowering the prop shaft angle for better engine response. An underwater exhaust system keeps the cockpit clear of fumes, the transom free of diesel dust and helps deliver quiet power from idle to full throttle loads. Transom deadrise is 15-degrees, which provides a superb combination of sea keeping characteristics with an easy to plane hull. The hull skin features a blister resistant modified epoxy resin for long-term durability in the marine environment. The Viking 54 is in excellent company and comes to the offshore fishing wars with the ammunition to earn a place at the Winner’s Circle. The 160 square-foot cockpit is all about winning efficiently. Molded non-slip on the cockpit sole provides sure footing even when wet and large scuppers drain water quickly. A walk-through transom door with a lift gate takes the work out of boating trophy fish. But when you are in release mode, the three-foot reach to the waterline means you can turn a billfish loose in heartbeat and get a fresh bait back out seconds later. Stand-up anglers and crew will appreciate the rounded cockpit comings when tangling with stubborn fish. Flush rod holders, recessed stainless-steel hawse pipes and cleats keep the cockpit clear for action. Simply put, if you lose a fish aboard this ride, it will not be the boat’s fault. A mounting plate laminated into the sole will anchor the mightiest fighting chair. Hatches to the lazarette and to the insulated fish and stowage wells are finished on both sides and supported with stainless-steel gas struts. Locking hatch pulls and heavy-walled gaskets seal out spray and wash down water. Next to the fighting chair, the observation mezzanine pioneered by Viking offers the second best seat in the cockpit. The flying bridge overhang provides sun and spray protection and the cushioned seats are comfortable for watching baits and waiting out the fish. 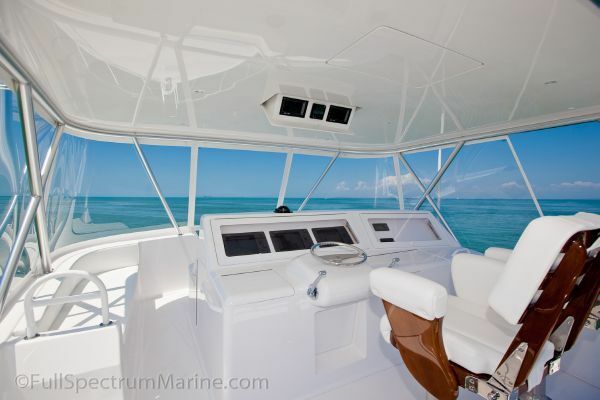 Beneath the seats there is tackle and gear stowage, a bait freezer and engine room access. An anodized aluminum ladder with nonslip treads provides secure, fleet egress to the bridge. Nearby in the salon step, an insulated drink box means no one goes thirsty and no one need miss any of the action in the cockpit. Displacing over 37 tons, the 54 Convertible will never win a weight savings competition with some backyard built day boat. But when you are fishing 100 miles offshore and the wind starts to blow hard enough to fling the tops of the waves over the bridge enclosure you can look at your watch and assure the crew they will not be late for dinner or miss the kids’ soccer game. The minute you get behind the helm you can the feel the weight as it crushes through head seas like you are stepping on grapes. Electronic engine controls in the custom helm pod deliver hair-trigger response and the power-assisted hydraulic steering matched to stainless-steel high-performance rudders assures uncanny maneuverability to out dance a tail walking sail or make a giant bluefin see a boat keel for the first time in its life. The centerline helm provides wonderful sightlines for fishing, reading skinny Bahama waters or backing into a tight slip at a crowded marina on a busy New Jersey summer weekend. Electronics stow safely beneath clear acrylic panels in raised fiberglass pods, so navigation information is available in any weather condition. This smart design also provides a sizeable compartment underneath the helm and makes servicing the electronics practically a day at the beach. A Moritz safety monitoring system tracks critical engine and ship status with audible and visual alarms. Twin Murray Products teak ladder back helm seats supply ample comfort for the long rides and guests will enjoy the forward and port lounges with stowage below for rods and other tackle. There is room for a chill box to refresh the crew without leaving the bridge and a port jump seat is prime location for spotting tailing sailfish in the wake. Specify Viking’s sister companies, Atlantic Marine Electronics and Palm BeachTowers for your equipment rigging needs and your Viking 54 Convertible can be delivered turnkey ready. A molded fiberglass sliding door leads to the spacious salon. Immediately inside the doorway to port is an eye level electrical distribution panel for ease of operation. Teak joinery fills the area with richness and detail. Air conditioning flows quietly from the valances for comfortable cooling and thorough distribution. An L-shaped lounge to starboard features stowage below, while a hi-lo teak cocktail table adds versatility. Above the dinette, a 42-inch flat screen television with surround sound is ideally situated to be viewed throughout the salon. The galley is U-shaped for maximum efficiency and features Corian countertops, under-counter Sub-Zero refrigeration, a microwave/convection oven, an electric cook top, in-sink garbage disposal, a water tank gauge, Amtico brand vinyl flooring, an electrical sub panel and loads of stowage space for dinner and cookware, groceries and supplies. To complement the starboard dinette, a pair of bar stools with upholstered backs is included by the aft galley counter. 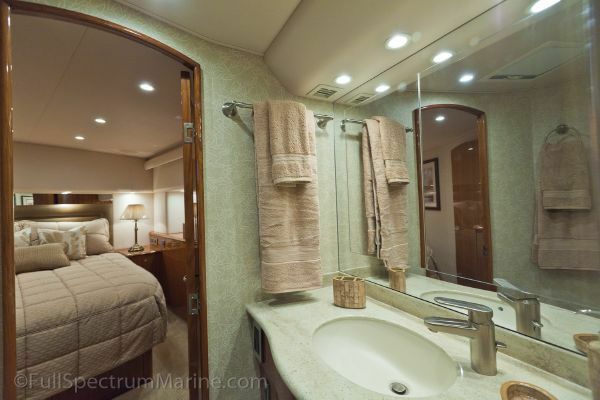 The three-stateroom two-head layout includes a master suite to port with a walk-around queen berth flanked with teak night stands and a credenza to port. A 20-inch flat screen television is mounted above a second credenza. A generously proportioned maple-lined hanging locker accommodates a sizable wardrobe. The forward stateroom comes standard with a queen berth, but also is available with upper and lower berths. Both plans offer plenty of stowage and hanging locker capacity. The starboard stateroom starboard stateroom has upper and lower berths crisscross berths along with a good amount of locker space. Each of the three staterooms is fully carpeted, has stereo controls and speakers, overhead Halogen and rope lighting throughout. The heads feature Amtico brand vinyl flooring, one-piece fiberglass shower stalls, and medicine cabinets with mirror doors, exhaust fans, air conditioning and electric MSD with holding tank and overboard discharge capabilities. No other boat builder invests as much as Viking in research and design. For proof, start with our new $1 million five-axis-profiler, the largest of its type in the marine industry, this was used to produce numerous mold parts incorporated into the manufacturing of the yacht. The stand-up engine room features Viking’s leading edge powder-coated web-frame structural steel engine beds. These are mounted to dedicated transversals for vibration free engine and drive-train alignment. With standard power, the Viking 54 Convertible will have a cruise speed of 31 knots and with optional power will top out at speeds approaching 40 knots depending upon load, sea state and boat condition. Standard fuel capacity is 1,445 gallons in Viking made fiberglass tanks, which are designed to mirror the hull bottom to provide maximum draw. Additionally, the tanks, (including water and waste) are then secured into place with fiberglass adding to the strength and structure of the hull. Fuel capacity can be increased to 1,745 gallons for additional range. For stability and sea keeping ability, the running surface features a convex deadrise shape matched to an aggressive entry with sharpened waterline sections. The convex deadrise adds curvature and form to the hull bottom, which increases the lifting motion in a seaway. Upon re-entry, the hull meets the water softly to enhance the ride and overall comfort. The hull is cored with end-grain balsa and the bottom is vacuumed-bagged to hand-laid fiberglass laminates. Through-hull areas including struts, shaft logs and water intakes penetrate solid fiberglass. All overboard discharge through-hull fittings are manufactured of fiberglass to eliminate corrosion potential. 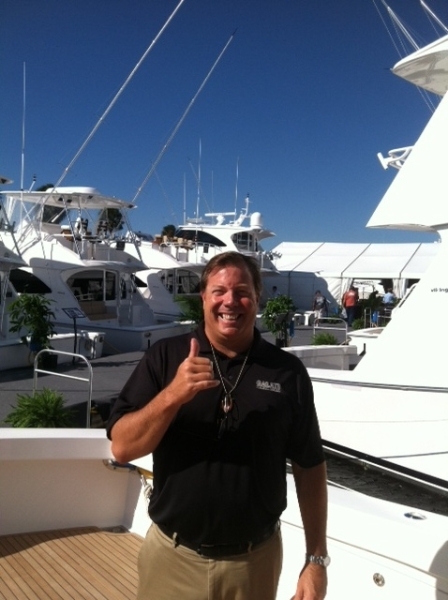 Family owned and operated for almost five decades, Viking is unique in the marine industry. Vertically integrated, virtually 90 percent of a Viking is manufactured in-house. Viking even designs and builds its own molds. Debt free, we only answer to ourselves and are able to deliver what it arguably the best riding, best performing convertible yacht in the world. But even that is not enough for us. Viking also is the only manufacturer with a full-service satellite facility in South Florida staffed by Viking trained technicians solely for the convenience of Viking Yacht owners.